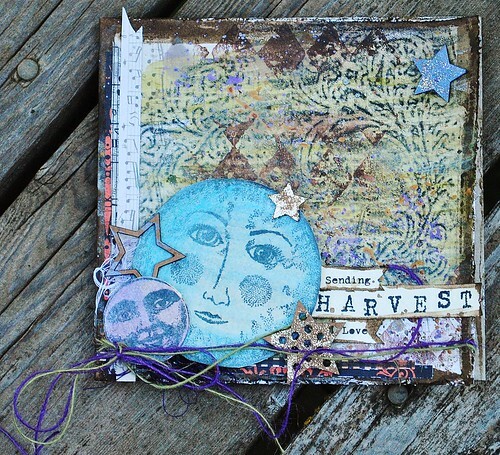 The winner of our blog hop with May Arts is Sherry Butcher! Congratulations! Please email your mailing address to naoko@fabercastell.com. Thanks! Don't forget to stop by the May Arts blog for their winner! Hello dear friends! Kasia Krzymińska here. I'm so happy and honoured to be here and I can't wait to share with you my very first project made as a Faber-Castell Design Memory Craft® guest designer. What I prepared for you is very simple tag with hand-drawn butterflies. For today's project I wanted to work with my Paper Crafter Crayons™ again. These are really so versatile and I wanted to show another (and SUPER easy) way to use them. Hi friends! I had the best time creating this and I'm going to tell you just how I did it but first I have to point out the orange/yellow highlights on the main part of the acorn. I LOVE that! It's as simple as pie! Simply highlight parts of your project using Paper Crafter Crayons before painting. Yep. That's awesome. It withstood paint AND Gesso and it still shines on. YAY! It's Stephanie here and I am so excited to be sharing my first project as a part of the new Faber-Castell Design Memory Craft® Guest Design Team! I have to admit that I am a very clean and simple type crafter. I like clean lines, equal margins and a neat look. But I also love to play with product and get creative with inks and mediums that you wouldn't usually associate with my clean and simple style. So my goal, while being a part of this guest design team, is to show you that the amazing products that Faber-Castell Design Memory Craft® offers, can work with any crafting style. You just have to know what you like and make the product work for the look you're going for. So today I have a card to share with you that features some canvas flowers that I made using stamps and canvas, along with Gelatos® (Raspberry, Green Tea, Lime Lime, Watermelon, Snow Cone, Acqua Dolce and Silver Metallic), a Stamper's Big Brush Pen (Black #199) and a PITT® Artist Pen (Black #199). Hello! It's Amy , to share a card I made, to celebrate the coming of fall (the best season of all in Kansas, I believe), with the shining silver (or blue) moons, crisp, colorful leaves, and cool evenings. Since I enjoy fall so much, and I wanted to create a sweet, colorful and textural card to send to my mom who shares the love of this season as well. I decided to start with a black paper crafter's crayon, Halloween Patterned Paper, and a texture fades embossing folder, to make an interesting and fun background. Welcome to the Faber-Castell Design Memory Craft / May Arts blog hop! Leave a comment here and on the May Arts blog for a chance to win $50 in product from Faber-Castell Design Memory Craft and May Arts! For an extra entry, leave a comment on our Facebook page and the May Arts Facebook page! This blog hop will end at 12am EST on September 28th. Winners will be announced on the companies’ blogs on September 30th. mixed media piece for a sweet new baby girl. Here are the May Arts products I am going to work with! Then using some Stampers Big Brush pens to color the flowers. Right after I color each flower I mist it with a little water so it blends. I used Gelatos to color my project! I used Gel Medium to adhere the flowers and leaves. And PITT pens to add lots of accents. And there you have it!!! I hope you are emjoying the blog hop! Rita Barakat Rita channels her boundless energy into her family (she has 5 kids! ), directing a youth choir & drama team, and her eclectic paper crafting projects. Hello! Tatiana Yemelyanenko is here today sharing my first project as a Faber-Castell Design Memory Craft® Guest Designer. I’m so excited and honored to be a part of this amazing team. I chose the pictures of the last day of spring. I so love these poppies in the field! It’s Stephanie here and I am super excited to be a part of the Faber-Castell Design Memory Craft® blog hop with May Arts. For my card, I decided to go a little more simple and let the vibrant colours of the Stamper’s Big Brush Pens and the beautiful lace ribbon from May Arts take center stage on my card front. The completed card turned out exactly as I pictured it would in my head and I love how each element on the card stands out and draws the eye in. May Arts and Faber-Castell Design Memory Craft Blog Hop! Each day this week, we posted a new project on our blogs. Make sure you hop to both blogs and the Facebook page for more chances to win and more inspiration! Jen Matott here to post the final project for the hop! When I got my package of ribbon, I was so excited with all the different textures and colors! I knew I had to include several on my project. I chose to create a canvas for the Halloween season. Here's a peek at how I used our Textural Accents, Gelatos, and Mist Making kit.